Getting a divorce can turn your world upside down. 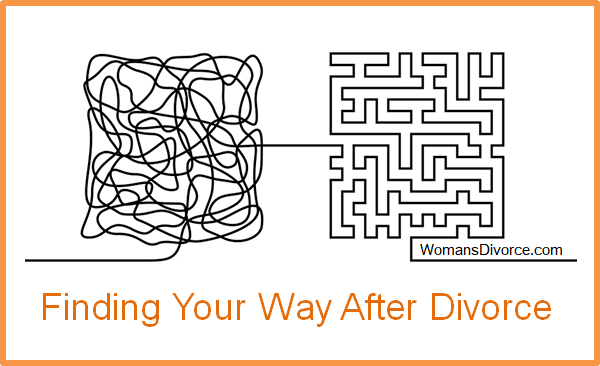 Here are some tips on how to cope with divorce and the inevitable changes that go along with it. As much as we all hope for a carefree life, there are going to be events that change life forever. Nothing stays the same, change is inevitable; but sometimes the change is unexpected and unpleasant. It might be just a move to another town or country; it might be a divorce, or death of a spouse or child. How can we cope with this type of change and organize a whole new way of life? The first thing to remember is that we don't have to fix or cope with everything in a day. You may be overwhelmed by grief, anger, confusion or fear, and getting through the day is as much as you can do. This doesn't mean these feelings will last forever, sometimes you need to let yourself wallow in them. Take time out to rest, re-evaluate and re-group. At times, a domino effect occurs and a combination or series of stress-inducing events occurs. You may have to deal with death or divorce, moving, job-hunting and children all at once. Each family member is also coming to terms with the loss and problems of restructuring his or her life. Tempers and emotions run high. Before you do anything else, deal with the emotions. Whatever your situation, call a formal meeting with your immediate family members (the ones that are in this just like you are.) Acknowledge the feelings. Find out what the biggest fears are and talk about them. When each person has had a turn talking and all the fears have been listed, brainstorm together to come up with a list of tasks for an action plan for each person. What will make the fear go away? How can you help each other to make things better? Each person (even the smallest child) should have a to-do list. Often what is a big fear for a child is something that you can reassure them about right away. With death of a spouse or divorce, children are worried that something might happen to the remaining parent. You can assure them that you are taking good care of yourself and hope to be around for a long time. Be reassuring but don't promise anything you don't have control over. The child is being realistic; something could happen to you, or one of them for that matter. This is not the time to talk in detail about the fact that we don't know when it's our time to go; but you should start thinking about things like insurance and wills for yourself. This is a big topic, but if you have been left on your own, this is something that needs to be addressed when you are feeling more in control of things. The main thing is to project a positive attitude. What is done is done, it can't be changed, but you can all learn to adapt, millions of others have and it isn't always fun; but it is not going to be like this forever. Start a personal journal; write down all your feelings, questions and observations on what is happening to you and your children. Do this in a free flowing way. Set aside some time to write ten or fifteen minutes - let it all hang out on the page. If you do this every day and review your journal once a week you may see themes emerging. Those themes are patterns of a problem that needs to be worked on first. Encourage each child or family member to keep a journal and provide a notebook for each one. Sometimes they don't want to do this, but assure them that whatever they write will be for their eyes only and no one else will read it. Whatever you do, don't intrude on their privacy, let them write and get it all down on paper. They may want you to read it and that is great but, respect their right to privacy and encourage the rest of the family to do the same. If someone doesn't want to keep a journal, give them the notebook anyway. Schedule a little family meeting each day where you all touch base and record your to-do's and plans for the day. Some days you won't feel like doing this, but try to do it every day. It puts some structure into a life that is out of control and allows everyone to feel like they are moving ahead. Encourage them to cross-off the tasks, no matter how small, as they are accomplished. And don't overdo this; keep the lists reasonable and doable, it is better to have three things to do all day than to make a long list that is just going to overwhelm you. Don't be afraid to seek professional help if you find that you need a little extra help. Consider talking with your family doctor, your minister, or a very close friend. Sometimes all it takes is talking with someone who is not inside the problem. Other people often see things from a different perspective and can help you organize your thought on the different aspects of your situation. Now is not the time to worry too much about all the household chores that need to be done; although, keeping things as normal as possible will help somewhat. Just make sure to ask everyone in the family member to help. Good or bad - nothing lasts forever and you can reinvent your life as many others have. Planning a new life, while overwhelming, can be exciting if you take it a step at a time and don't try to do it all alone. And remember, you don't have to do it all in one day.